We earlier made a list of places to have unlimited food in Udaipur. 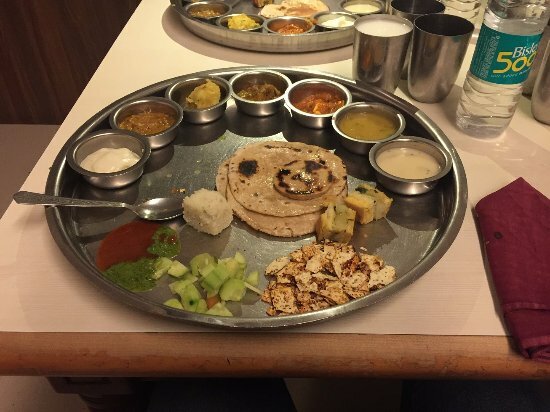 We got a lot of requests for listing down the restaurants that serve Thali in Udaipur. So here is a list of the most popular places in Udaipur that will satiate your cravings for having an authentic thali. 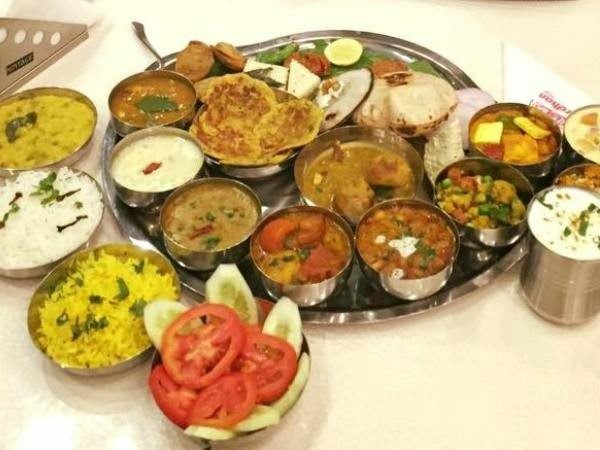 This restaurant gives you mouthwatering dishes in their thali like Dal Bati Churma, Rice Besan Ke Gate Roti, Dessert, Curd. Quite famous Gordhan Thal would serve you a thali comprising the authentic Dal Bati Churma, Rice Besan Ke Gate Roti, Dessert, Curd, Papad. And apart from the that the Thali also has starters! Giving you a very amazing view from its rooftop, Laziz Affair Serves You starters, 3 types of Sabzi, 1 Dal, Salad, Curd, Rice, 4 Chapati and 1 Sweet. Another whiplash of great taste is at Punjabi Laziz. 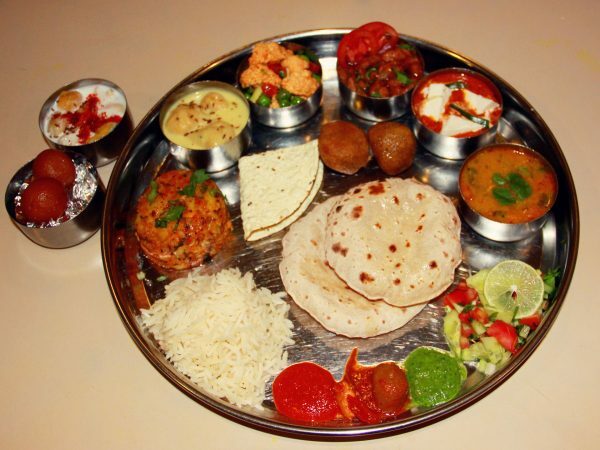 The place offers 3 kinds of thali. The most basic one contains Dal Roti, sabzi; the intermediate one has paneer, raita and one added sweet dish. The last and most expensive one has the same eatables as the intermediate one, just with increased quantity. Punjabi Tadka has myriad of dishes in their thali: you get soup (starters), salads, dal-roti, sabzi, Curd, and the entire main course that one can imagine. The added benefit is the dessert part. 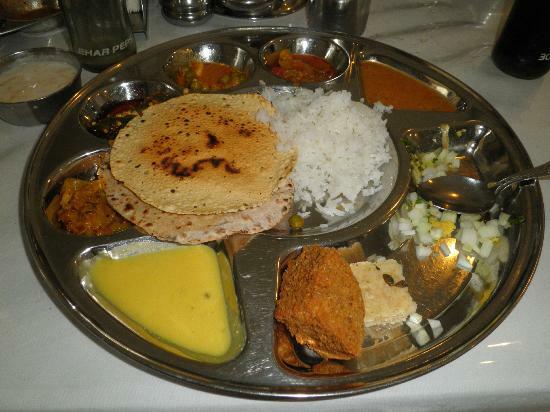 Padam Thal is one of the most famous eateries that serves thali in Udaipur. They have Starters, 4 Sabzi, Dal, Kadi, Chapati, Bati, Rice and the whole thali has 16 items in total! Whoa! Ok! 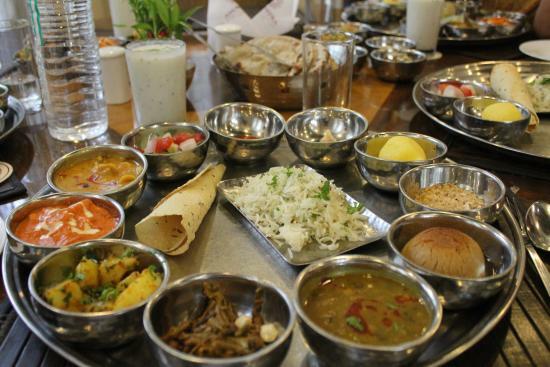 With unlimited food, Natraj Dining Hall and Restaurant is the most famous and most munched on Thali in Udaipur. It has all the food that one can ever demand! This place has been there for decades now and has been serving great food since then. The Thali here consists of a Sabzi, paneer, starters, desserts, and chapatis. Garden Hotel is a beautiful and royal place to have great food. The thali has 4 sabzi, various types of starters, chapati, bati, rice, sweet dish. The food is prepared without onion and garlic. They have Thali only for lunch and have two kinds of Thali. For the one where you have to visit Udaipuri serves you 3 types of Sabzi, 1 Dal, Dal Bati, Paneer, Raita, Sweet, and Rice. 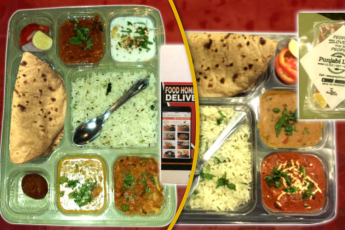 Another one is the takeaway thali or packing thali (as they referred to it when I asked them) which contains all the above dishes and further has lachcha paratha, salad, starter, rice. Meera Restaurant is the second place (apart from Natraj) in this list where you can get unlimited food at a very low price. They will give you unlimited Kadi, Aloo-Jeera, Dal, Mix Veg, Dahi, Papad, Boondi Raita! They also have a Punjabi Thali which comprises Shahi Paneer, Salad, 5 Chapati, Dahi, Papad. They have two types thalis and have a great taste. 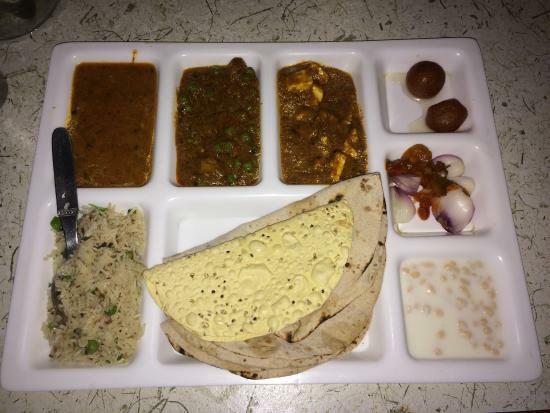 The first thali has Paneer Tikka, 1 Sabzi, Gulab Jamun, Raita, 5 Chapati/Lachcha Paratha. The other thali has all the aforementioned dishes with Chach, Gatte ki Sabzi, Dahi Bade. 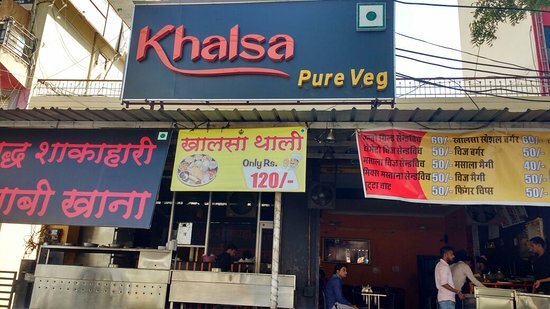 Khalsa is one of the most popular eateries in Udaipur serving great taste at a very nominal price. They have a single thali for which the menu changes every day. Navidya is the restaurant of the hotel Amantra. 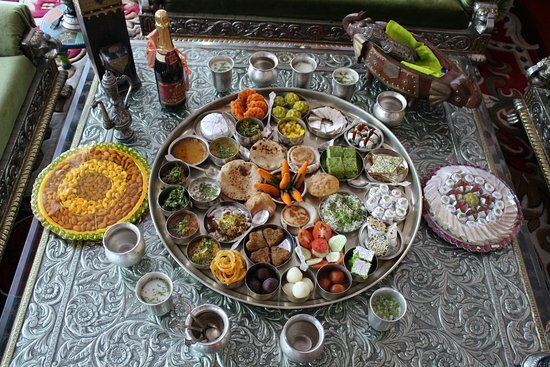 The thali is ornate and has Dal Bati, other Rajasthani Dishes, Paneer, Rajbhog, Rice, Missi Roti, Papad, Raita etc. 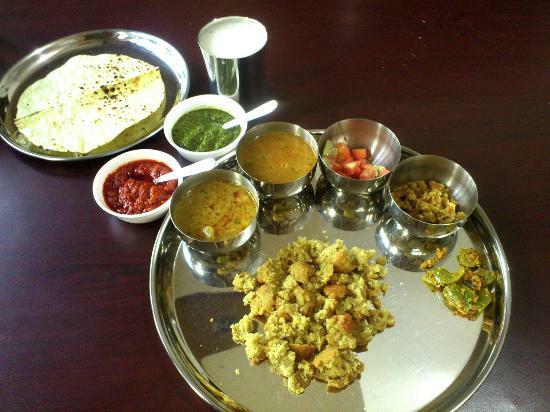 This thali is served only for lunch. It is the most expensive one in the list but tastes good. Which one of these places will you go today! ?